MVA-loading cannot exceed the generator rating. This limit is imposed by the stator heating. MW-loading cannot exceed the turbine rating which is given by MVA (rat­ing) x pf (rating). Obviously Q is positive for lagging power factor, Φ being the angle of OM from the P-axis. A mere scale change will convert these values to the units of MVA, MW and MVAR. Constant S operation will lie on a circle centred at 0 and radius OM. 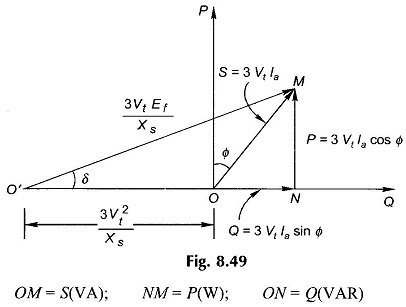 Constant P operation will lie on a line parallel to QO′-axis. Constant-excitation (Ff) operation will lie on a circle centred at O′ of radius OM(3VtEf/Xs). Constant-pf operation will lie on a radial line through O.
by δ (max), the safe operating value from the point of view of transient stability. 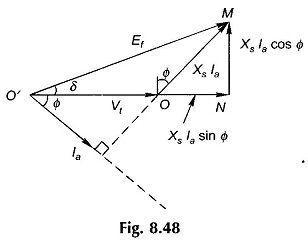 Since the minimum excitation operation corresponds to δ = 90°, the machine operation is at a safe limit from Ef (min) by specifying δ (max). The capability curve of the synchronous motor can be similarly drawn and will lie in the lower half of the PQ-plane and “lag” and “lead” regions will interchange.